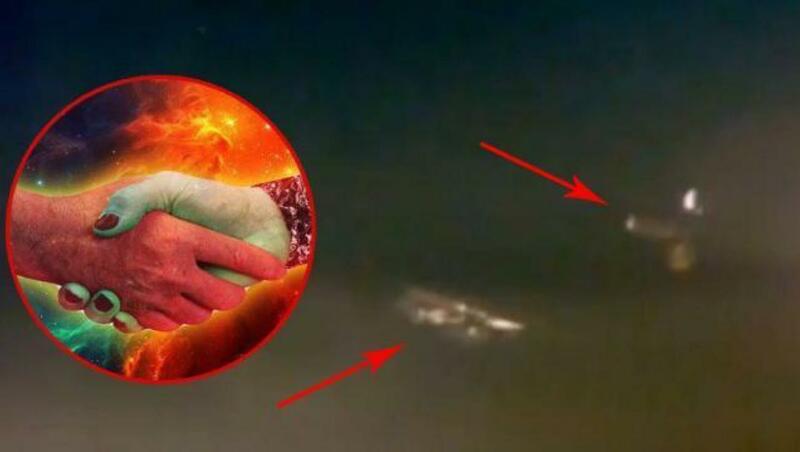 The ISS camera made a strange encounter between two bizarre objects that happened over our heads. The video was put on YouTube by Streetcap1 and immediately caught the attention of UFO fans. The 7-minute video shows two gilded, metal objects slowly approaching each other, but the film cuts before the conclusion we all expected. The observation took place in front of the International Space Station and it is intriguing how this time the food was not abruptly cut off. During the first 4 minutes of the video, the two objects have a strange transparency and this has given skeptics reason to believe that the appearances are nothing more than image artifacts caused by the flaring of the lens . But from 4 minutes, the shape of the two objects begins to become more apparent. They also seem to make subtle adjustments to their direction and speed, while lighting up and slowly changing their shape. Judging by the reactions of YouTube commentators, this incident left the strong impression of an orbital meeting that should have remained secret. “When I watch this sequence again and again, I feel that the image on the right could be the Hubble satellite. On the left, I think and think it’s the Black Knight? This object certainly shows a similar symmetry. This strange video allows us to draw interesting conclusions. First of all, the speed of the two objects corresponds to that of the International Space Station. Since they remained in view for at least the duration of the video, it can be assumed that the occupants of the ISS were well aware of the presence of the two objects. Secondly, when in orbit around the Earth or another planet / satellite, two spacecraft that have corresponding velocities usually attempt to dock with each other. This gives us reason to suspect that one or both objects have encountered the ISS before or after the shooting. This would not be the first time such contact has taken place. Last year, former NASA engineer Mark McClelland said he attended a meeting between astronauts and a 9-foot alien in the cargo bay of a space shuttle. A similar scenario could have taken place aboard the ISS.